You want to think long term when embarking upon piano lessons. Given a choice, most kids might not always brush their teeth, clean their rooms or do their homework. Practicing the piano is no different. If your child asked you, “Do I have to do my math homework? I don’t like math”. If you’re like most parents you would tell them that math is an important part of their education and it’s necessary that they do the work. Practicing the piano is no different. Families who value music education are successful with their children’s piano lessons. The vast majority of piano students go through slumps when they just don’t practice as much as they should. If you are waiting to stop the lessons when that occurs, you are setting up your child for failure. You are better off not starting piano lessons at all and finding something else that you can commit yourself to. The best you can do as a parent is provide the finest instrument and teacher you can afford and encourage your children to practice and reward them with opportunities to play for family and friends. Practicing is hard work if done correctly. I have met countless people who have expressed great regret for having given up on piano as children. It is a delicate balance getting your children to practice. They must practice in order to grow but if forced can end up hating it which defeats the whole purpose! But if you can work with your children positively, the rewards are a lifetime enjoyment of music. A piano investment is not like buying other things. Unlike a car, refrigerator, TV, or countless other purchases, the piano you buy can last a lifetime. The higher the quality of the instrument you invest in, the higher the resale value because cheaper Asian pianos depreciate much more quickly than hand-made American and European pianos. That is why buying a used, higher end piano in good condition makes a lot of sense for many people. With the current market, it is a phenomenal time to get exceptional value in many things including pianos. Should you rent a piano? In playing the piano, different parts of the body are utilized according to the requirements of power and speed. The more power required, the more mass of the body is utilized. The more speed, the less mass is needed. – Finger technique: When the utmost in speed is required, only the fingers will do. – Arm technique: When massive strength is called for as in big chords, only the arms can provide enough power. – Wrist technique: While not as powerful as the arms, the wrists are faster than the arms and more powerful than the fingers. – Wrist technique: While not as powerful as the arms, the wrists are faster than the arms and more powerful than the fingers. For passages that require power and speed, the wrists can accomplish both. The wrists provide the right balance of speed and power for octave and fast chord work. Octaves are accomplished by positioning the hand in two perpendicular “C’s” which utilize the power of the arch for strength and support. There are benefits to both acoustic and digital pianos. However, if the primary purpose is learning to play the piano, an acoustic piano is best. A digital piano has many features that are useful for other purposes such as working with music software, practicing with headphones, and playing a wide variety of sounds. But the piano action of an acoustic piano has nearly 100 parts for each key which provides a much higher level of performance. The subtleties of touch and pedaling enable much more expressive performance on an acoustic piano. An upright might be a good choice if space and budget are limited. However, a grand piano offers superior touch and tone. The vertical motion of hammers in a grand piano offers faster repetition than the horizontal hammer motion of an upright piano. Also, the length of the keys beyond the fall board is greater on a grand piano than on an upright offering better leverage when playing black keys and between black keys. Finally, the sound of a grand piano projects into the room, not into the wall. You may be surprised at how easy it is to place a baby grand piano since it looks good on all sides and can be placed in a corner. If budget is unlimited, buying new can be a good choice. However, it comes with risks. A piano doesn’t reach its full potential until it has had a chance to season and become broken in. So, it is difficult to assess the quality of a new piano until years down the line. Also, if there are any major manufacturing defects in a piano, it will almost always evidence itself within the first few years. Used pianos can offer tremendous value but you must have knowledge in order to make the right buying decision. Factors include the quality of the manufacturer, as well as the history of the specific piano in question. Asian production pianos cost a fraction of hand-made American and European pianos. They are best bought new or nearly new because once they wear out, it doesn’t pay to restore them because they are so inexpensive to begin with. American pianos are a dying breed. We have gone from over 300 manufacturers prior to WWII to 3 companies producing pianos in the United States today. While everyone knows Steinway is a great piano, there are several other piano companies that produced pianos equal to Steinway which can be purchased for a fraction of the cost if you know what to look for. Because this is a vanishing commodity, there is lasting value in these instruments and it can be worthwhile restoring Mason & Hamlin, Knabe, Sohmer, Chickering, Baldwin and many other great American pianos. Unlike people, pianos don’t age unless acted upon by outside forces, namely environment and use. A piano that isn’t played very much and has spent its life in a stable environment in regards to temperature and humidity may only require reconditioning in order to achieve a high level of performance. This is true of some high quality pianos 50 or 75 years old! Other pianos much younger may require rebuilding which involves removal of the strings and plate, and complete restoration of the 10,000 parts throughout the instrument. While this is very costly, the high price of new hand-made pianos makes this investment worthwhile for the right instrument. With pianos, all things being equal, bigger is better. This is due to the longer strings and bigger sound board which offer enhanced tone. However, it is important to match the size of the piano to the room. A larger piano produces more volume. So you must assess the acoustics and purpose of the piano to determine what size is appropriate for the space. Unlike almost everything else you buy, you buy a piano only once if you make the right decision. This is because a piano can last a lifetime if it is properly cared for. So you should think beyond your current family situation and home and project far into the future when making a purchasing decision. While a piano is a musical instrument, it is also one of the most significant pieces of furniture you invest in. So, consider the look of the piano so that you are happy living with it. 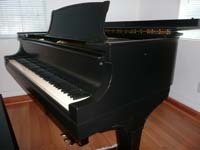 Black pianos are the most popular, offer the easiest resale, and also are most versatile. But you should ultimately get what you like to be happy. While it is important to make the right decision when getting a piano, ultimately it is about satisfying aesthetics. You must not over think it. If you feel an attachment to the sound and look of a piano, it is probably the right one to get. Because then you will want to play and hear the instrument. Educate yourself as to what to look for, but ultimately make the decision based upon what you love. Finger technique: When the utmost in speed is required, only the fingers will do. Almost all piano technique can be reduced down in its simplest form to hand positions and finger patterns. As a beginner, most people learn to play with 5 fingers of each hand over 5 keys. In time this is expanded. Ultimately this is the basis for all piano technique. So What Are the Best Piano Brands? 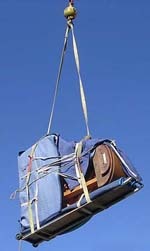 The country of origin is often the best indicator of the quality of pianos. Since piano production began in Germany and the United States, these represent the very best piano brands. Charles Walter is a relative newcomer which builds only about 65 pianos each year. Both companies have factories throughout Asia (not just in Japan) and the best pianos they build are made in Japan. They offer everything from budget instruments to hand-made pianos rivaling the best German and American pianos. Samick sells pianos under many different brand names including Kohler and Campbell, Knabe, Sohmer, Pramberger, Remington and many more. These are referred to as “stencil pianos” since the original manufacturer is either out of business or it is a made up name. Young Chang sells pianos under the Weber name. What Are the Best Piano Brands? The country of origin is often the best indicator of the quality of pianos. Since piano production began in Germany and the United States, these represent the very best, pianos. There are a handful of piano companies which make pianos equal in quality to Steinway. (For example: Bösendorfer, Bechstein, Fazioli, Blüthner and Mason & Hamlin are all top notch pianos with rich histories.) In fact, if you look in the latest supplement to “The Piano Book”, by Larry Fine, New York made Steinway pianos are rated in the 3rd rank of pianos according to manufacturing quality. So why is Steinway recognized as the undisputed leader? In a word: marketing. Just as Microsoft dominates computer software because of aggressive licensing arrangements, John Steinway helped propel Steinway & Sons to its market dominance through exclusive artist contracts and favorable institutional arrangements. There are some pianos from the period that Steinway was owned by CBS in which Teflon was used in place of the felt bushings in the action. Some of these pianos exhibit problems. However, the issues are not nearly as severe as the problems of Steinways from decades earlier suffering from verdigris (a condition of gumming up of action parts as a result of having them dipped in paraffin oil when manufactured). One of the biggest problems with Teflon action parts is that few technicians know how to deal with them properly. Usually they can work fine unless there is a major change in climate. Here Steinway is getting a bum rap! While one could argue that Mason & Hamlin upright pianos and some of the extinct American companies from years ago produced superior upright pianos, Steinway uprights are by no means sub-par pianos. The fact that they don’t measure up to their grand pianos is the nature of uprights compared to grands. This is a beautiful myth created by Steinway to sell more than the 2,500 or so pianos that Steinway produces. These stencil brands are rebadged Kawais made in Japan, and Pearl Rivers made in China. No company ever OEM’s higher quality instruments to competitors! And the buyer must pay a premium since 2 companies have to make money on the sale. You are better off buying a Kawai or Pearl River directly from the manufacturer. Or better yet, search out a high quality, used American piano other than Steinway since the Steinway name has a price premium attached to it. Just as there is a mystique to the Steinway name, there is romance to the Hamburg Steinway name. 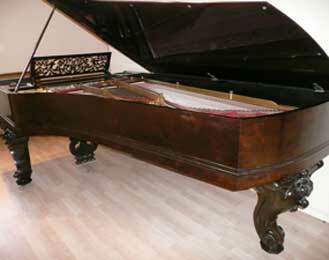 Perhaps there is more consistency from era to era in the German manufactured Steinways. 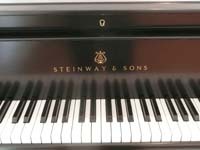 However, a great Steinway is a great Steinway and there are phenomenal instruments from both factories. TOP 5 Steinway Piano Myths. There are a handful of piano companies which make pianos equal in quality to Steinway. Find out 5 common Myths associated with the iconic piano company. 1. Steinway is the best piano in the world. 2. When you move a piano it has to be tuned. This is a half truth. The fact is, a piano that is moved will show up pretty much as it left most of the time. However, after the piano gets acclimated to its new environment, it will require tuning. The piano may not sound bad, but the pitch of the entire instrument may adjust slightly up or down. It is important to keep a piano stable. It is best to wait at least a couple of weeks or even longer after a move before tuning to make sure the piano has settled. 3. Kids banging on a piano may damage the instrument. While it can grate on your nerves, the force with which kids hit the keys of a piano even with their fists can’t match the power professional pianists inflict upon a piano in concert. Just be sure that the children don’t take sharp or heavy objects to the keyboard since this can damage the instrument. 4. The fall board of a piano must have a slow close feature to avoid injury. The slow close fall-board feature of a piano is a great marketing tool. The truth is, unless you have some really wild kids, the incidence of being hurt by a falling fall board is quite rare. Most of the best pianos including Steinway do not offer a slow close fall board. 5. You shouldn’t place a piano on an outside wall. Even in a temperate climate, the insulation of modern homes will keep the temperature fairly stable even on an outside wall. However, it is important to avoid direct sunlight on your piano. This will not only effect tuning stability, but it will fade the finish in a matter of weeks. Also, you should keep your piano closed particularly at night. If you leave your windows open at night, the moist night air will rust the strings. Also, even with the piano closed, the cooler air can make the sound board contract destabilizing the tuning. Use your judgment in balancing the enjoyment of your piano versus its longevity. I’m interested to hear your opinions and thoughts on these piano myths. Please leave some comments below. Thanks for reading. Perhaps you are aware of the crises facing music and arts programs in the public schools. Music programs are being eliminated in elementary schools and severely limited in middle and high schools all around the state. Music and arts education is fundamental to a complete education. At this time I am offering my Living Piano: Journey Through Time: Historic Concert Experience as a fund-raising tool for school music programs. While there are numerous studies linking higher verbal and math scores to music education (UC Irvine: Raucher, Shaw “Mozart Effect”), music and arts awareness also has intrinsic value. It is a recurring pattern of cutting funding for essential subjects when budgets are challenged. We must work together to raise awareness and money to help offset these cuts. If you are passionate about this, you can help by offering any small tips on how together we can bring Living Piano: Journey Through Time to schools in support of music and arts programs. Please respond within this blog or contact me, Robert Estrin at Robert@LivingPiano.com 949-244-3729. You can get more information at www.LivingPiano.com. Thank you for your support. Perhaps you are aware of the crises facing music and arts programs in the public schools. Music programs are being eliminated in elementary schools and severely limited in middle and high schools all around the state.